A drapery style is determined by the header of the drapery. Choosing the right drapery style can be key to enhancing the beauty of your window treatment . It is also important to know that the style of drapery will function well with the drapery hardware. We recommend choosing the drapery style first and then decide on the proper drapery rod and hardware to fit the drapery. We will discuss some of the most common custom styles available. The Three Finger Pinch Pleated Style is the most common and traditional style of drapery. Most custom draperies are fabricated as pinch pleated draperies. With this type of drape you will need a traverse rod. The traverse rod can be a standard white traditional rod or a decorative drapery rod. The Two Finger Pinch Pleated Style is similar to the Three Finger Pleated Style. The difference is the pleats are not as full. Each pleat is pinched twice instead of three times. If you have limited space and want draperies that are not quite as full this is a great option. Tuxedo pleated Panels has chic broad flat sections approximately 4" apart. There is a buckrum behind each section to give it a stiffness. This type of drapery is used for stationary panels only and is not recommend for draperies that open and close. Pins should be placed behind the seam of each section to attach to a rod. 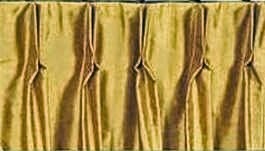 Tuxedo pleated draperies are usually supported with a traverse or decorative rod with rings or carriers. Goblet Pleated Panels are best used in a formal setting because of its hand shaped elegant goblet shaped pleats. This style is recommended for stationary drapery panels. Drapery pins are inserted behind each goblet pleat. The goblet pleats can be embellished with trimmings to gave it an added custom look. Decorative rod with rings or carriers are recommended for this style. Rod Pocket Draperies or panels are a stationary style curtain. A rod is shirred through the pocket of the draperies. The drapery pocket is available in various sizes such as 1 1/2", 3" or 5". This is a more casual traditional style. A pole with no rings , a standard white curtain rod, or a café curtain rod can be used to support this style of drape. Drapery pins are not necessary. Grommet Style Draperies are a contemporary style drape with grommets along the top of the drapery. The grommets are usually 1 1/2"-2" in diameter and can be made larger if desired. This style can be stationary or hand drawn on a round drapery pole. Drapery pins or rings are not necessary. The grommet should be 1/2"-3/4" larger that the drapery pole. Tap Top Drapery Style are a casual and modern style. Taps Tops can be a very creative style. Tap tops can be made stationary or as a full drapery to open and close. The taps can be made in different colors than the drapery and each tap can be pinched for a more unique and elegant look. This style is very popular in children's rooms because the drapery can be used with a pole, alleviating the need for drapery cords. A decorative rod is used to support the tap top drapery. be made in various widths. Why Use A Interior Designer? Child Safety and Window Treatment Cords Beware!